﻿ How to Make the Most of Year-End Donors » Red Mango Marketing! The end of the year is prime time for nonprofits. Thirty percent of all online giving happens in December, with 10 percent of the money annually donated online coming in during the last three days of the year. Whenever you send a fundraising appeal, always include the option to make a recurring gift. Better yet, use this as a focal piece in your year-end campaign. Instead of just asking supporters to give one year-end gift, urge them to sign up to give every month for the next year. This is a win-win situation for everyone involved — donors can give more over time and you have a steady stream of dependable funds. Attach giving levels, special perks, and impact descriptions to monthly gift tiers so that you make recurring giving an attractive option. Make it easy for your donors to share your message and fundraise on your behalf by giving them tools to share your message via social media. Include social sharing buttons on your donation confirmation and thank you pages, in your thank you letters, and in follow-up emails. Provide prewritten messages so your donors can easily spread the word. Since enthusiastic supporters are often your best spokespeople, let their passion create a wave of donations by teaching them how to set up a fundraising campaign with a peer-to-peer fundraising tool, such as CrowdRise. Turn first-time or casual givers into repeat donors by sending them a warm, timely, thank you letter. Then, keep them up to date on the impact of their donation. Stay in touch so they feel like a true part of your community and can relive the helper’s high over and over again. When donors know their gift was appreciated and made a difference, they’ll be more likely to give again. Of course, these efforts will also help you keep your current, loyal donors devoted for years to come. With just a few, simple steps, you can see an even bigger result from all of your hard work this December. Maximize your year-end fundraising efforts by making it easy for donors to give more, leveraging their networks, and having a plan to retain them. 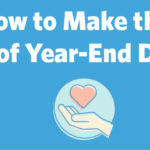 The post How to Make the Most of Year-End Donors appeared first on Constant Contact Blogs. This entry was posted on Monday, December 17th, 2018 at 9:30 am	and is filed under Email Marketing, News & Updates, Nonprofit. You can follow any responses to this entry through the RSS 2.0 feed. Both comments and pings are currently closed.